The best views at Charles A. Ransom Nature Preserve in Charlevoix County aren't along its trails but in the parking area, standing on your bumper if you can. 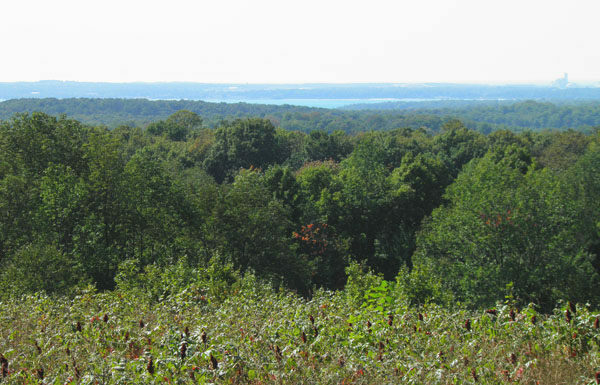 The trailhead is located on the top of a ridge making it the highest point of this 80-acre preserve at an elevation of 973 feet, or 320 feet above Lake Michigan. Everything else is downhill including its trails. 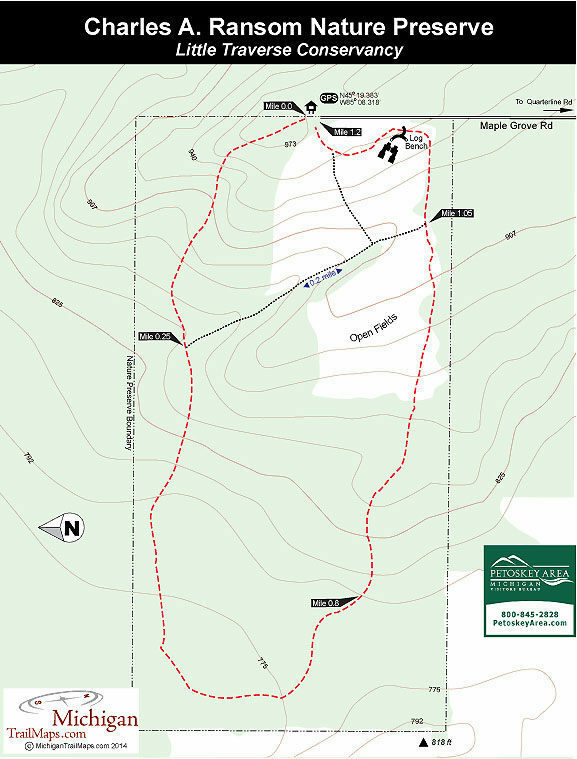 Donated to the Little Traverse Conservancy in 1976, the Ransom tract includes 1.5 miles of trails with the perimeter of the system forming a loop of 1.2 miles. Most of it is a walk in the woods dominated by ash and basswood sugar but there is 20 acres of grassy meadows and shrubs that was once a farm field. In the summer you can search the open area for wild blackberries and strawberries while in the spring the woods are filled with trillium. Needless to say, October is a particularly enjoyable time to visit the preserve due to the brilliant fall colors of the maples. The preserve is open to mountain biking, horseback riding and cross country skiing as well as hiking. But keep in mind that the trail begins as a steady and sometimes steep drop of almost 200 feet in elevation in less than a half mile. This, and its limited mileage, discourages most mountain bikers and Nordic skiers. Following the loop in a counter clockwise direction, you immediately enter the woods from the parking area and begin the descent down a glacial moraine. It’s steady and at one point you’re aided by a series of steps. The trail levels out briefly at Mile 0.25 where the junction with the crossover spur is posted and then resumes dropping. Along the way you pass some impressive beech and maple trees. The trail bottoms out at Mile 0.4 in a young second growth forest and swings to the north and resumes climbing at Mile 0.8. Within a quarter mile you break out along the edge of the meadow that once served as a farm field and arrive at the junction for the crossover spur. To continue along the perimeter head right and within a 100 yards you top off on a grassy section of the ridge. A large log bench is located here and is an ideal spot to relax and take in the view. A bit further along the trail, just before the parking lot, is an interpretive display that points out what you’re looking at. 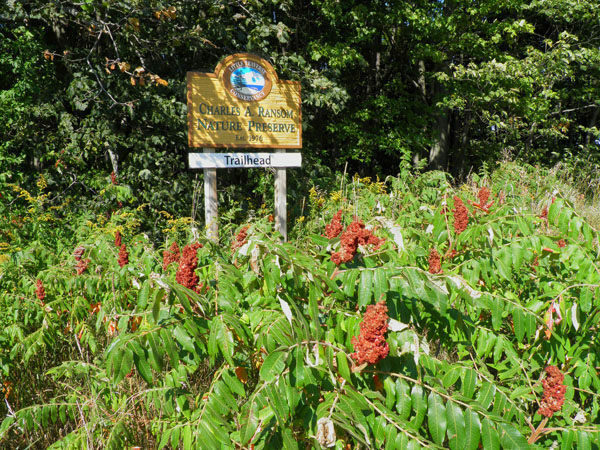 The landmark features are not easy to spot, even on a clear day, but include tip of the Leelanau Peninsula, North Manitou Island, the Fox Islands and even Beaver Island. The easiest to distinguish landmark is Lake Charlevoix, which at 14 miles long and 2 miles wide is the third largest inland lake in Michigan. Other than a parking area and a display map, there are no other facilities at the Charles A. Ransom Natural Preserve trailhead. 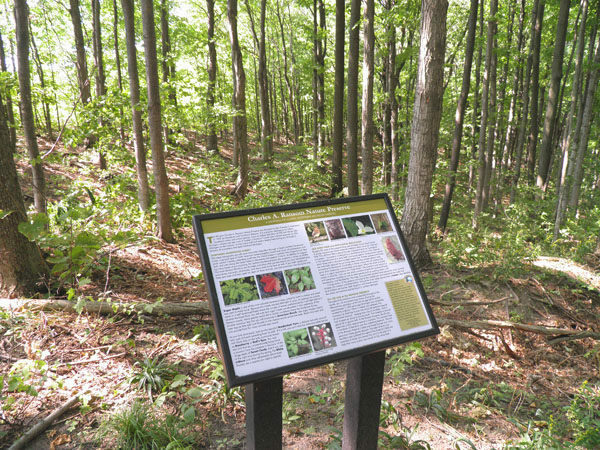 There are no vehicle or entry fees to hike at Ransom Nature Preserve. From US-31, 9 miles south of Petoskey, head east on Burgress Road. Within 3.5 miles turn north (left) on Quarterline Road until it ends in a mile at Maple Grove Road. Turn west (left) on Maple Grove Road to reach the trailhead parking area in 0.75 miles at the end of it. For more information contact the Little Traverse Conservancy (231-347-0991; www.landtrust.org) or the Petoskey Area Visitors Bureau (231-348-2755, 800-845-2828; www.petoskeyarea.com).